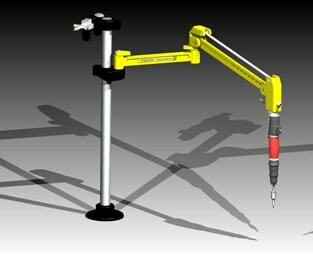 The Tappex FlexiArm® installation equipment consist of 1-3 individual pantograph arm(s) with a Desoutter pneumatic screwdriver(s) attached to each. The screwdriver can be specified with either manual or automatic reverse torque-clutch control and normally operate @ either 510 rpm or 1,100rpm depending upon the thread insert’s size and the material into which it is being installed. The FlexiArm® provides a lower-cost assembly solution for many different post-mould applications and can often, because of compact size, be located adjacent to the respective injection or compression-moulding machine, this results in more efficient manufacture as inserts can be installed during the down or waiting time of a typical mould cycle. It is available with one, two or three arms (which can be fitted at a later date) to suit most multi-task assembly requirements. A range of Tappex production drivers (029 series) are available to provide an accurate method of installing the inserts at various heights and positions in the moulding (see inset). Available also separately to suit M2 to M8 threads and most equivalent Imperial sizes. Tappex can provide a convenient installation tray for use with the Flexi-Arm. This is suitable for prefix Trisert part nos: 136, 137, 138, 170, 336, 338 and Foamserts : 040 in a range of sizes from M2 to M6.